It's a lot easier to change the Constitution, than it would be to change the word of the living God, and that's what we need to do, is to amend the Constitution so it's in God's standards. Alex Koppelman and Vincent Rossmeier at Salon, however, have an important article demonstrating Huckabee's ties to prominent voices in the Reconstructionist and Dominionist movements that seek to establish a theocracy, or as near as possible, in the United States. Among those connections are George Grant, the former executive director of D. James Kennedy's Coral Ridge Ministries; Janet Folger, the founder of Faith2Action; Rick Scarborough, the founder of Vision America and self-described "Christocrat;" Michael Farris, the founder and chancellor of Patrick Henry College, the stated mission of which is "to prepare Christian men and women who will lead our nation and shape our culture with timeless biblical values;" and Don Wildmon, the chairman and founder of the American Family Association. Now, does all this prove that Huckabee is, himself, a Reconstructionist or Dominionist running a stealth campaign to undermine the Constitution and replace our democracy with someone's notion of "God's rule"? No. But the next time you hear Huckabee complain that his religious beliefs have nothing to do with the job of President, just laugh in his face. Good post. Having attended an evangelical Christian college myself (a couple of decades ago), I can assure you that even moderate evangelicals would like to see a greater Christian influence in the USA. They honestly believe that their current level of influence is not wide or deep enough. They aren't all full-blown theocrats, but they are committed to ensuring that the Christian voice is heard loudly and clearly and that this voice has real affects in the political arena. Huckabee may well be one of the moderate types rather than a Dominionist. That doesn't mean that he couldn't do real damage, as Dubya's presidency has already demonstrated. 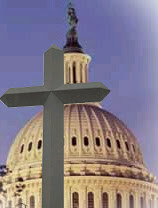 Christians have every right to participate in American politics. So secularists like us need to keep ensuring that our voices are heard and that we have appropriate influence in the political and social spheres. If Christians keep pushing for inappropriate influence in such areas as science curriculum, then we just have to keep pushing back. They won't like it, and things may get ugly sometimes, but that's the nature of political battles. Secularists should never be rude, but we should always be firm.